Seabuckthorn is one of those lesser known though often used plants found in natural cosmetic products because of the brilliant healing and skin softening properties it contains. It is the high saturated and polyunsaturated fats in the seabuckthorn that enable it to be used in skin creams and liniments. Also high in antioxidants it can be used in cosmetic formulations to help inflammatory disorders, cell anti-ageing, to enhancing microcirculation, epidermal regeneration and is a natural UV blocker. The seabuckthorn is a dioceious plant, which means it has separate male and female plants. The male produces brown flowers that produce the pollen and the female produces orange berries, rich in oil, which is the part that is used in cosmetics. The kinds of products you may find it in moisturisers, soaps, sun lotions and perfumes. Though it can grow all over the world - from Sweden to Mongolia, Pakistan to Nepal, even here in the UK, 90% of seabuckthorn is found in China where the shrub is used for soil and conservation purposes. Its basal shoot system makes this plant a good wind break. It also helps to stabilize riverbanks and steep slopes. 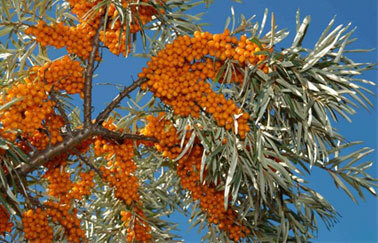 The seabuckthorn is edible and quite nutritious though does have quite an acidic, astringent taste. One of the greatest sources of Vitamin C, it has about twelve times the amount found in oranges! You can use it to make pies, juices, liqures and in Finland it's even used as a nutritional ingredient in baby food. It has been used by herbalists over the centuries to relieve coughs, aid digestion, help blood circulation, treat gastritis and diarrhea, eczema, conjunctivitis, metabolic disorders and rheumatoid arthritis.